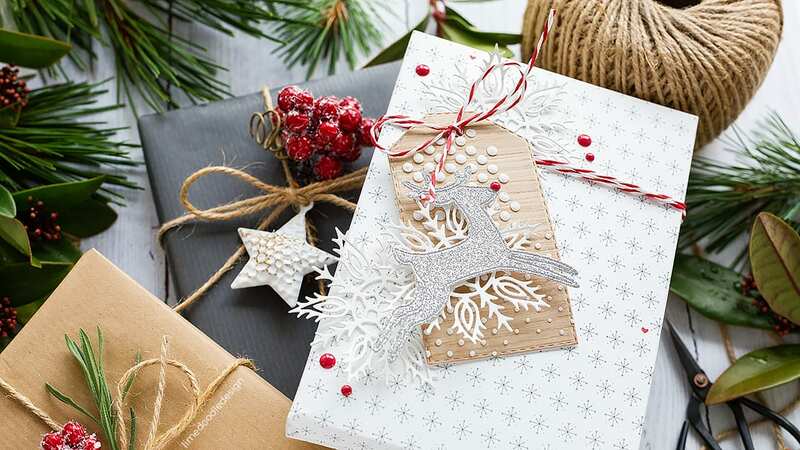 Do you use your craft supplies for your holiday gift wrapping? 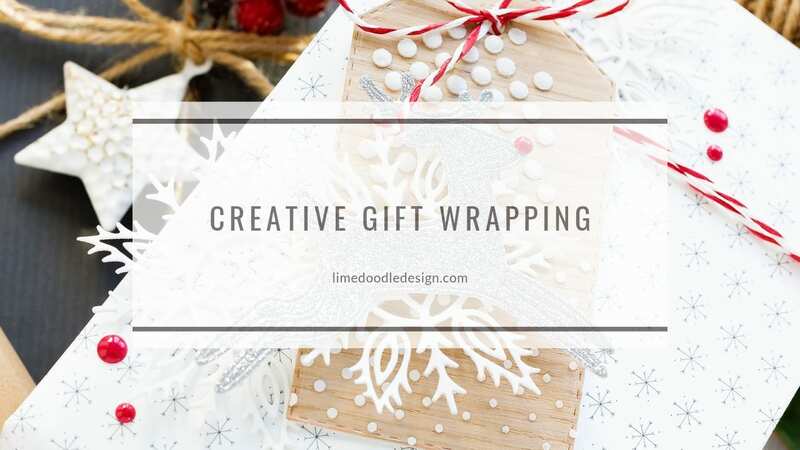 I love gift wrapping, and I think it is worth the extra time to dress a present. The look is unique and for me tells the recipient how much you care. I’ve linked all supplies at the end of this post. Compensated affiliate links used. I started with a piece of sticky back wood veneer (similar wood veneer), I’m not sure where I got this from, but thin balsa wood, kraft card stamped with a woodgrain pattern, or wood effect pattern paper would work equally as well. I adhered the veneer to a piece of white card as a base and to give it some thickness and then ran it through my die cutting machine with a tag die from the Simon Says Stamp Stitched Dress Up Tags set. I’ve recently been revisiting my love of stencils with embossing paste, and if there is one embossing paste, I think everyone should have it is this white one from Wendy Vecchi. This little pot is where my obsession with embossing paste through stencils started. I used a palette knife to swipe the embossing paste through the Tap Dance stencil. I say it every time, but you can’t beat lifting a stencil to reveal the pattern below. Each and every time it is a joy to see the result from what is a really quick and simple technique. I cut a second white tag using the Stitched Dress Up Tags die and adhered that to the back of the wood tag to give a good weight and nice clean finish. I then started building a scene with die cuts. 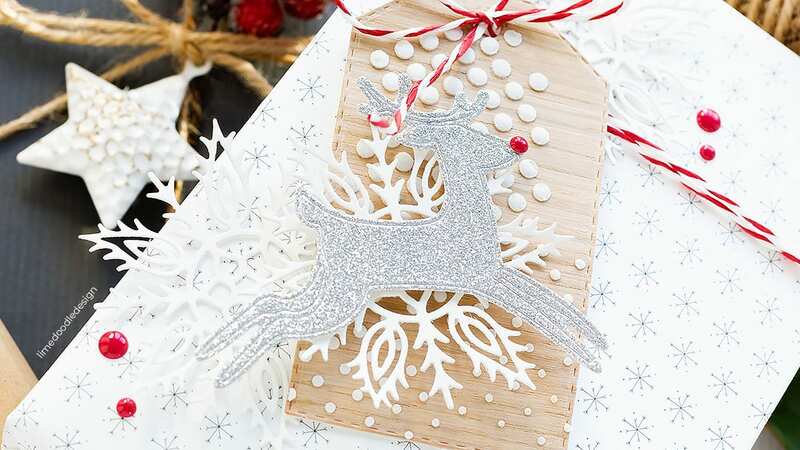 I cut the Dancing Deer die from silver glitter card and the Alicia Snowflake from Ivory card. The deer did get a little lost if only using the delicate outline though so instead I mounted the outline on white card, filled in with the negative pieces and then trimmed out. This way I had a nice solid embellishment that would hold it’s own but still had an elegant look. Also, the advantage of a die cut set onto the white card like this is that I can add foam adhesive to the back and it won’t be visible. This will not only add more dimension but also gives me the perfect way to adhere the snowflake too, trapping it between pieces of foam adhesive and then mounting onto the wood veneer tag. I paired this tag with a present I’d already wrapped. 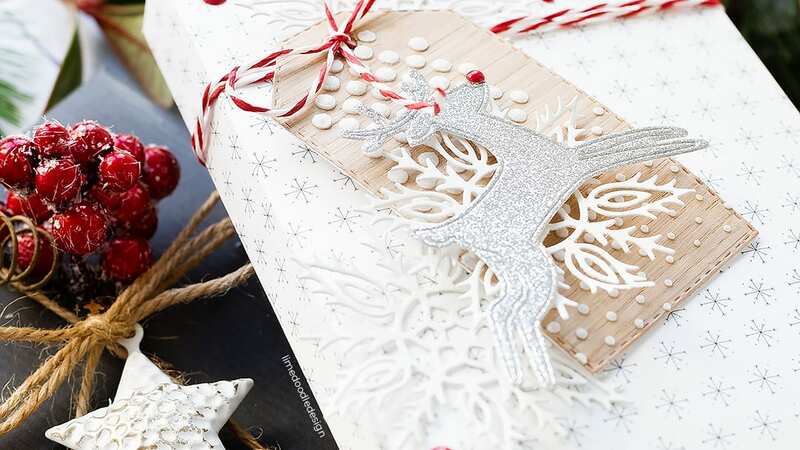 I thought the wood tag with white snowflake and silver deer with a red nose would accent this paper perfectly. I tied red raffia twine (similar twine) twice around the present and then strung the tag onto the twine and tied a bow. I like to extend the decoration out from the tag over the whole of the present, and so I die cut a couple more of the Alicia Snowflake die from Ivory card and then adhered those on the body of the present tucked in behind the tag and kept them in place with Nuvo Deluxe Adhesive. I then dotted around a few more red enamel dots and called this present done. That’s one present down, lots more to go over the next few weeks! I really like this white, kraft, grey and red look this year and think I’ll be decorating more presents in this style for under the tree. Wow, this is beautiful, both the tag and the package, I love it all. 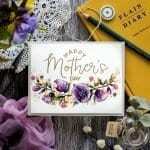 It’s awesome and I would like to use this inspiration on a card, thank you so much for showing! So beautiful, thank you for sharing….just love that snowflake, however I do find that the customs charges have caught me out a couple of times now…wish sss was available in UK! You’re going to make your recipient of that gift VERY very happy. Every little detail is a stunning addition. So beautiful. Thank you so much for sharing.